Jeb has averaged a somewhat respectable 53/28% favorability rating among the Republican party faithful in the first half of this year. But keep in mind - this is his base. These are the people that he should have eating out of his hand, yet they aren't. On average, nearly one in 3 Republicans views the heir to the Bush legacy unfavorably, while just over half view him favorably. It gets worse when looking at specific polls. Monmouth University recently found just 40% of registered Republicans view Jeb Bush favorably, while 35% view him unfavorably. PPP was out the same day with a survey showing Jeb's favorability rating underwater with likely Republican primary voters, 37/40%. And the new YouGovUS internet tracking survey finds him with a profoundly mediocre 54/34% favorability rating. Data compiled from The Roper Center's iPoll Database. 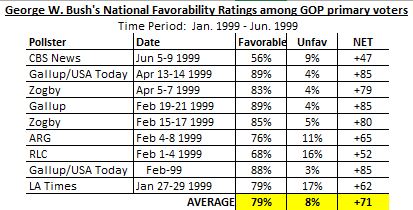 In the first half of 1999, George W. Bush averaged an astonishing 79/8% favorability rating across nine national surveys. Now, to be fair to Jeb, neither Mitt Romney nor John McCain saw anything like the popularity George W. Bush experienced from Republicans in the lead up to his nomination. Still, the difference between Jeb and George's place in the eyes of GOP primary voters at this point in both campaigns is stark. The contrast doesn't stop with favorability ratings. Jeb Bush's standing in the GOP primary horse race, while one of the leading contenders, is quite weak compared to George W. Bush's. In the first half of 1999, the elder brother Bush averaged 45% among GOP primary voters across thirty-three national surveys, and led in every single one. His closest competitor, Elizabeth Dole, averaged just 18%. So, not quite the level of Hillary Clinton in the 2016 Democratic primary, but close. Contrast that with Jeb Bush. Of the twenty-seven GOP primary polls taken since January this year, Jeb has led in eleven. He has averaged just 15% in primary horse race polling. While George W. led his closest primary opponent by an average of twenty-six points, Jeb leads his closest contender by an average of 2%. In late June 1999, George W. Bush had amassed a whopping 59% support from Republicans. The most recent national GOP primary survey of the 2016 cycle, courtesy of Fox News, puts Jeb at 15%. And just in case base popularity and primary horse race polling hasn't convinced you of the younger Bush campaign's inferiority to his older brother's, consider the general election numbers. Jeb has averaged a paltry 41% to Hillary Clinton's 48% across twenty-three polls conducted since January of this year. During the same time period in 1999, George W. averaged an impressive 53-38% lead over the sitting vice president, across thirty-eight surveys. Bush vs. Gore data was compiled from The Roper Center's iPoll Database. 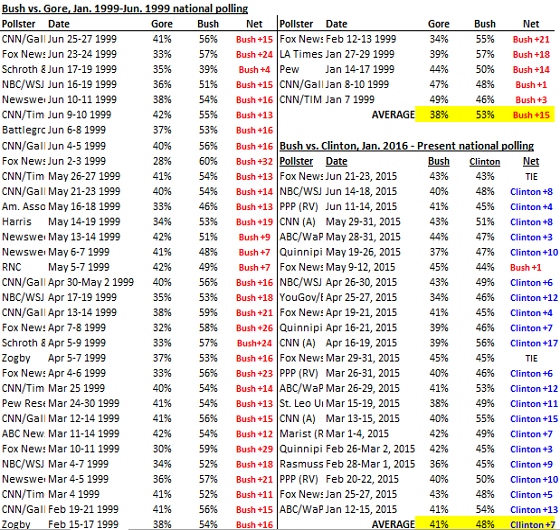 Jeb vs. Hillary numbers were compiled from The Huffington Post's Pollster, Real Clear Politics, and The Argojournal. Jeb's best performances against Hillary Clinton have consistently come from Fox News, peaking with their May 9-12, 2015 survey showing him ahead of Hillary by one point, 45-44%. But that's the only poll to show Jeb Bush with any sort of lead over Hillary Clinton across fifty-eight general election polls taken since January 2013. Clinton has led led Jeb by as much as seventeen points in polling taken over the last six months. 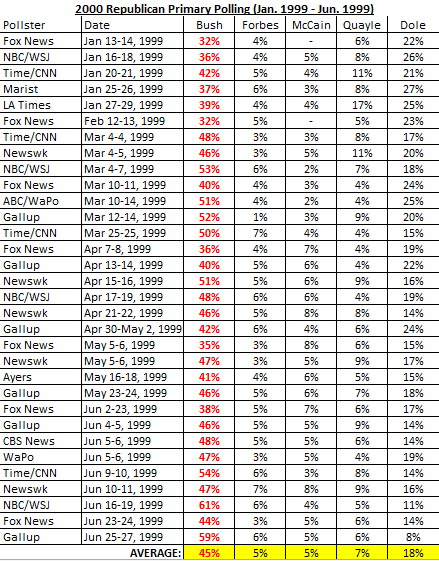 Unlike Jeb, George W. led in all thirty-eight general election polls released between January and June, 1999. Furthermore, of the 124 general election polls conducted between Al Gore and George W. Bush from January 1997 to January 2000, George W. led in all but five - all of which were conducted in 1997, and thus, very early in the campaign. His strongest polling lead over Gore during the January-June time period of 1999 was a Fox News poll, putting him up an astounding 60-28%! 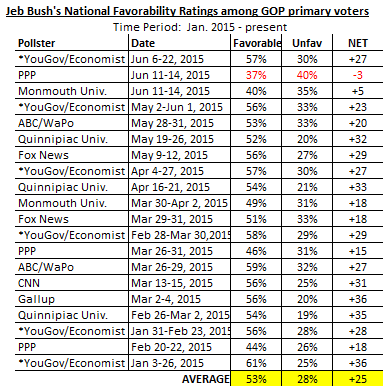 Jeb would give his right harm to see numbers like that against Hillary. But he's not even close. Having pointed out the obvious differences in their pre-primary polling results, I'd also caution that Jeb's substandard performance in comparison to his brother shouldn't preclude him from capturing the party's nomination. Mitt Romney and John McCain saw nothing even close to the numbers George W. experienced in the lead-up to the 2000 Iowa Caucus. And as FiveThirtyEight's Harry Enten recently noted, George W. Bush's pre-primary popularity was quite the anomaly. Regardless, the Bush brothers may be related, but Jeb's current polling trajectory couldn't be more different from George's.